PRICE IS FOR A FULL FRONT BUMPER DIY KIT. Our Paint Protection Film is a tough but clear urethane film, which when applied to your car’s surface, provides protection against minor scuffs, scratches and stone chips which can occur as a result of every day motoring. Stones literally bounce off your car’s surface without leaving a stone chip which is both costly to repair and may devalue your car when you come to sell it. 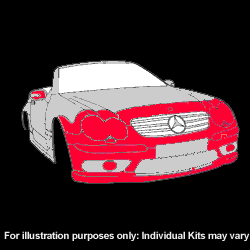 Our computer designed car kits fit your car like a glove, so that there is no need to cut on your vehicle. The standard package typically comprises the front section of the bonnet and wings, front bumper, headlights, mirrors and wheel arches. We can also protect other areas, for example full bonnets, wings and doors. There is no limit to paint protection film with full cars a regular thing now a days. The kit can be customised to meet your specific requirements and you can order as many or as few of the components as you wish. Should you need to discuss your requirements with us, please click on the “learn more” button to submit an enquiry. For aftercare instructions visit Care and Maintenance on the FAQ page. We provide a 5 year paint protection film warranty*. Our Paint Protection film self fit DIY kits are pre-cut to fit your vehicle like a glove and they couldn’t be easier to buy, using Chipguard UK’s mail order service. The kit will be delivered in a specially designed pack to protect it and for your security it has to be signed for on delivery. The film comes with a 5 year warranty*. To see just how easy the kit is to fit, take a look at the Installation Instructions and Video. To find out how to look after the film once fitted visit Care and Maintenance on the FAQ page. However, if you would prefer not to fit it yourself, Chipguard UK are approved installers of 3M VentureShield and offer a full fitting service at our dedicated workshop in Waterlooville and also as a mobile service*(Please contact us for further details). Our Films are the market leader in paint protection films having been tested worldwide, the results have proven that it is the clearest, strongest paint protection film on the market, being twice as strong as it’s leading competitor. The optically clear film allows full light transmission from your headlights, whilst it’s strength offers a high level of paint protection to the headlight and fairings from possible cracks, unsightly stone chips and minor abrasions. Our film is UV stable thus avoiding differential fading. The paint protection film will not shrink or creep, therefore preventing an unattractive “orange peel” appearance. It has a high gloss finish which enhances and protects the appearance of your vehicle’s and will not yellow with age. It protects your vehicle’s paintwork against damage and it will maintain it’s A1 appearance and resale value. A further benefit of this fantastic product is that we provide a 5 year paint protection film warranty*.